New in the Maker Shed, the Redpark Breakout Pack for Arduino and iOS is the first general-purpose serial cable that Apple has approved for the iPhone, iPad, and iPod touch. On one end, it’s got a dock connector to plug into your iOS device. On the other, it has an RS232 port that you can easily connect to Arduino or any other gadget that speaks a serial protocol. We’ve put together a pack that includes the cable, an RS232-to-TTL serial adapter (so you can connect the Redpark Serial Cable for iOS to an Arduino), and the Mintronics Survival Pack (to supply you with components and sensors to play with). 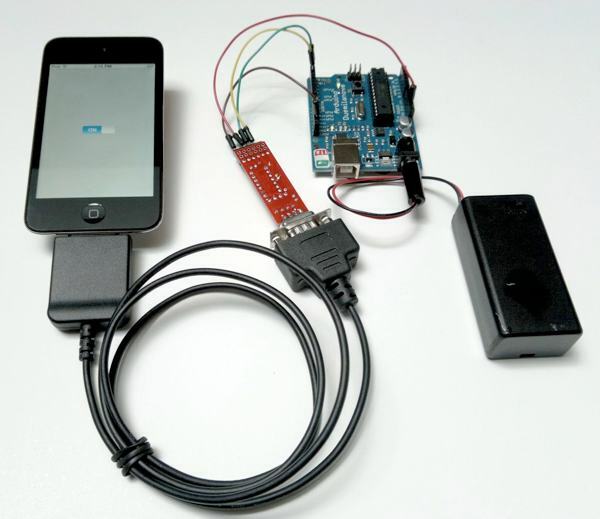 With the pack and an Arduino, you’re ready to build apps that connect your Arduino and iOS device. Supplies will be limited for the next few weeks, so grab ’em while you can in the Maker Shed! (You can also buy individual cables in the Maker Shed). To obtain the SDK, head over to Redpark’s product page, and click the Download SDK link. You’ll need to supply your email address to receive the SDK, but that’s it (no NDA, no requirement to be in Apple’s MFI program).